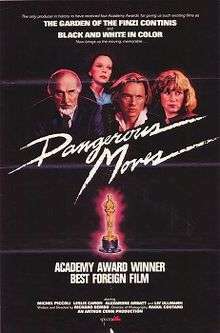 Dangerous Moves (French: La Diagonale du fou) is a 1984 French-language film about chess, directed by Richard Dembo and starring Michel Piccoli and Alexandre Arbatt. Its original French title is La diagonale du fou ("The Fool's Diagonal", referring to the chess piece called the bishop in English but the fool in French). The film was a co-production between companies in France and Switzerland. It tells the story of two very different men competing in the final match of the World Chess Championship. One is a 52-year-old Soviet Jew who holds the title, and the other is a 35-year-old genius who defected to the West several years earlier. The film won the Academy Award for Best Foreign Language Film in 1984; it was submitted by the Swiss government, and gave that nation its first Oscar win. It also won the Louis Delluc Prize, the Prix de l'Académie du Cinéma and the César Award for Best Debut. The CD soundtrack composed by Gabriel Yared is available on Music Box Records label (website).